The Man Who Brought G.I. Joe To Children Dies At 86 : The Two-Way Donald Levine brought the first G.I. Joe action figures to U.S. shelves 50 years ago after rejecting other possible names for military figures, like Salty the Sailor. At left is a reproduction of the original G.I. Joe action figure made in 1964. 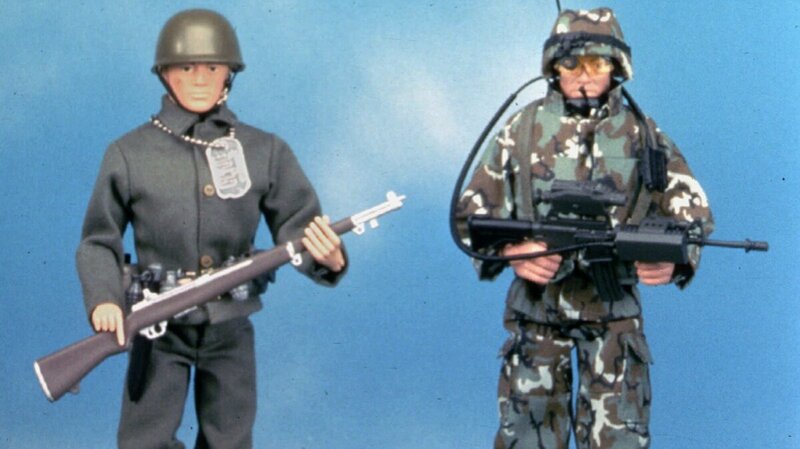 The doll on the right is a newer G.I. Joe model. Hasbro executive Donald Levine, who oversaw the action figure's creation, died last week of cancer. A half-century after the first G.I. 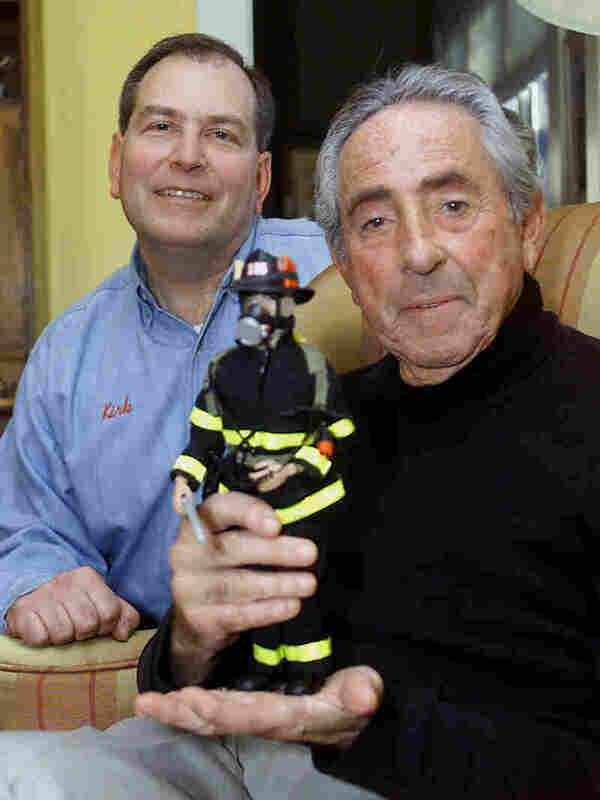 Joe action figures hit U.S. shelves, the man who oversaw the toy's creation has died of cancer in Rhode Island. Former Hasbro executive Donald Levine was 86. He was also a veteran of the Korean War who said that G.I. Joe was an attempt to honor those in the U.S. armed forces. "Someday I'm going to do something to honor this military, these military people, who fight in the wars," Levine said in archive footage cited by NPR's Elizabeth Blair for All Things Considered. "Nobody wins a war," said Levine, who died Thursday. "But they fight in the wars. And my attitude was, someday I'm gonna do it." Levine (right) with Kirk Bozigian, his co-founder in collectibles company Real Heroes Inc.
With a concept in hand, Levine and Hasbro — known as Hassenfeld Bros. back then — still needed a name. As Levine told Hembree, the original plan was to give the action figure several names, to match different branches of the military. The contenders included Rocky the Marine, Ace the Fighter Pilot, and Salty the Sailor. But Levine was asked to narrow the toy's identity to a single name — and after weeks of struggling with ideas, he said, he happened to watch a 1945 movie called The Life of G.I. Joe. He licensed the name, and an icon was made. From its introduction in 1964, G.I. Joe was a hit, making $28 million in its second full year. But the toy soldier faced hard times in the 1970s, as anti-war sentiment swelled in America. That led Hasbro to give Joe a beard and a kung-fu grip — and to outfit him for adventures and expeditions. "G.I. Joe was eventually furloughed in 1976," NPR's Elizabeth Blair says, "but then, six years later, he was re-launched to even greater success. In 2012, G.I. Joe was voted No. 1 in the Top 20 Toys that Define Childhood at the Children's Museum of Indianapolis." The action figure was inducted in the Toy Hall of Fame in 2004 — the same year as Scrabble and the rocking horse. In recent years, Levine sold rare prototypes of G.I. Joe figures, including one that went for $200,000 back in 2003. The toy has also inspired movies, cartoons and comic books. "He was, after all, the toy that made it OK for boys to play with dolls," Elizabeth notes.